Welcome to Barkman & Smith Physical Therapy's patient resource about Patellofemoral Problems. Two muscles of the thigh attach to the patella and help control its position in the femoral groove as the leg straightens. These muscles are the vastus medialis obliquus (VMO) and the vastus lateralis (VL). The VMO runs along the inside of the thigh, and the VL lies along the outside of the thigh. If the timing between these two muscles is off, the patella may be pulled off track. Problems commonly develop when the patella suffers wear and tear. The underlying cartilage begins to degenerate, a condition sometimes referred to as chondromalacia patella. Wear and tear can develop for several reasons. Degeneration may develop as part of the aging process, like putting a lot of miles on a car. The patellofemoral joint is usually affected as part of osteoarthritis of the knee. One of the more common causes of knee pain is a problem in the way the patella tracks within the femoral groove as the knee moves. The quadriceps muscle helps control the patella so it stays within this groove. If part of the quadriceps is weak for any reason, a muscle imbalance can occur. 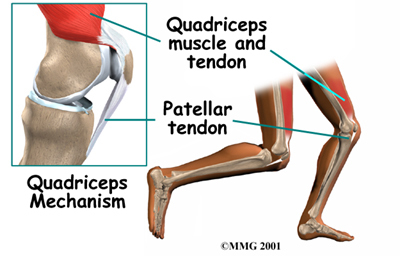 When this happens, the pull of the quadriceps muscle may cause the patella to pull more to one side than the other. This in turn causes more pressure on the articular cartilage on one side than the other. In time, this pressure can damage the articular cartilage. A similar problem can happen when the timing of the quadriceps muscles is off. There are four muscles that form the quadriceps muscle group. As mentioned earlier, the VMO is one of these four muscles. The VMO is the section of muscle on the inside of the front of the thigh. The VL runs down the outside part of the thigh. People with patellofemoral problems sometimes have problems in the timing between the VMO and the VL. The VL contracts first, before the VMO. This tends to pull the patella toward the outside of edge of the knee. The result is abnormal pressure on the articular surface of the patella. Another type of imbalance may exist due to differences in how the bones of the knee are shaped. These differences, or anatomic variations, are something people are born with. Some people are born with a greater than normal angle where the femur and the tibia (shinbone) come together at the knee joint. Women tend to have a greater angle here than men. The patella normally sits at the center of this angle within the femoral groove. 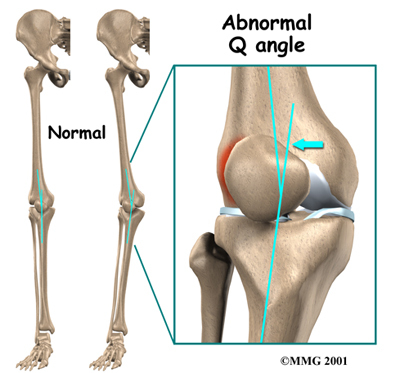 When the quadriceps muscle contracts, the angle in the knee straightens, pushing the patella to the outside of the knee. In cases where this angle is increased, the patella tends to shift outward with greater pressure. This leads to a similar problem as that described above. As the patella slides through the groove, it shifts to the outside. 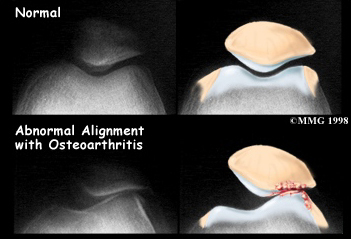 This places more pressure on one side than the other, leading to damage to the underlying articular cartilage. Biomechanical issues in the foot can change the alignment and rotation of the tibia and alter the angle of pull of the patella tendon. This too can lead to tracking problems of the patella in the femoral groove or breakdown of the patella tendon itself. Finally, anatomic variations in the bones of the knee can occur such that one side of the femoral groove is smaller than normal. This creates a situation where the groove is too shallow, usually on the outside part of the knee. 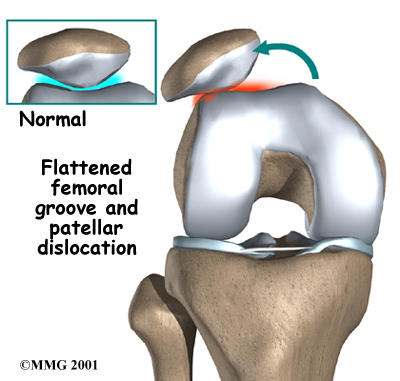 People who have a shallow groove sometimes have their patella slip sideways out of the groove, causing a patellar disclocation. This is not only painful when it occurs, but it can damage the articular cartilage underneath the patella. If this occurs repeatedly, degeneration of the patellofemoral joint occurs fairly rapidly. People who have a high-riding patella are also at risk of having their patella dislocate. In this condition, called patella alta, the patella sits high on the femur where the groove is very shallow. Here the sides of the femoral groove provide only a small barrier to keep the high-riding patella in place. A strong contraction of the quadriceps muscle can easily pull the patella over the edge and out of the groove, leading to a patellar dislocation. Patella alta is most common in girls, especially those who have generalized laxity (looseness) in their joints. What do patellar problems feel like? 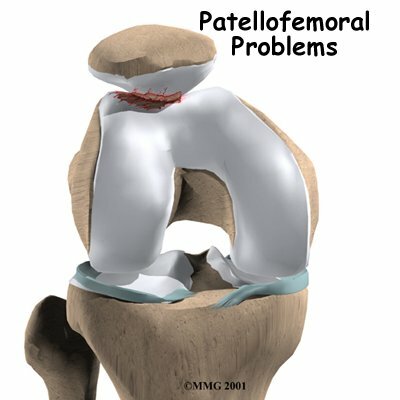 When people have patellofemoral problems, they sometimes report a sensation like the patella is slipping. This is thought to be a reflex response to pain and not because there is any instability in the knee. Others report having pain around the front part of the knee or along the edges of the kneecap. These symptoms may be due to problems with the way the patella lines up in the femoral groove. But symptoms of patellar pain can happen even when the patella appears to be lined up properly. 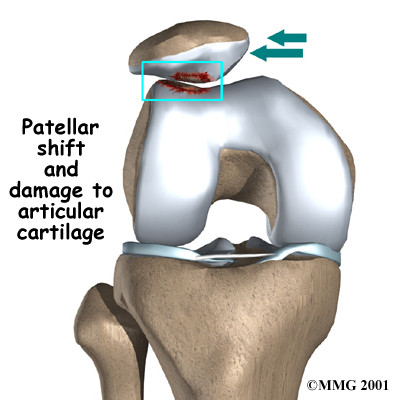 Patellofemoral problems exist when there is damage to the articular cartilage underneath the patella. This does not necessarily mean that the knee will be painful. Some people never have problems. Others experience vague pain in the knee that isn't centered in any one spot. Sometimes pain is felt along the inside edge of the patella, though it may be felt anywhere around or behind the patella. Typically, people who have patellofemoral problems experience pain when walking down stairs or hills. Keeping the knee bent for long periods, as in sitting in a car or movie theater, may cause pain. The knee may grind, or you may hear a crunching sound when you squat or go up and down stairs. If there is a considerable amount of wear and tear, you may feel popping or clicking as you bend your knee. This can happen when the uneven surface of the underside of the patella rubs against the femoral groove. The knee may swell with heavy use and become stiff and tight. This is usually because of fluid accumulating inside the knee joint, sometimes called water on the knee. This is not unique to problems of the patella but sometimes occurs when the knee becomes inflamed. When you visit Barkman & Smith Physical Therapy, your diagnosis will begin with out Physical Therapist taking a complete history of your knee problem followed by an examination of the knee, including the patella. Diagnosing problems with the patella can be confusing. The symptoms can be easily confused with other knee problems, because the symptoms are often similar. Although the time required for recovery varies, patients with patellofemoral problems often benefit from four to six weeks of Physical Therapy. The aim of treatment is to calm pain and inflammation, to correct muscle imbalances, and to improve function of the patella. Treatment for a patellar problem begins by decreasing the inflammation in the knee. Your Physical Therapist at Barkman & Smith Physical Therapy may suggest rest and anti-inflammatory medications, such as aspirin or ibuprofen, especially when the problem is coming from overuse. Physical Therapy can help in the early stages by decreasing pain and inflammation. Our therapist may use ice massage, ultrasound and electrical stimulation to limit pain and swelling. As the pain and inflammation become controlled, our Physical Therapist will work with you to improve flexibility, strength, and muscle balance in the knee. Muscle imbalances are commonly treated with stretching and strengthening exercises. Flexibility exercises are often designed for the thigh and calf muscles. Our Physical Therapist will use guided exercises to maximize control and strength of the quadriceps muscles. Bracing or taping the patella can help you do exercises and activities with less pain. Most braces for patellofemoral problems are made of soft fabric, such as cloth or neoprene. You slide them onto your knee like a sleeve. A small buttress pads the side of the patella to keep it lined up within the groove of the femur. An alternative to bracing is to tape the patella in place. Our Physical Therapist applies and adjusts the tape over the knee to help realign the patella. The idea is that by bracing or taping the knee, the patella stays in better alignment within the femoral groove. This in turn is thought to improve the pull of the quadriceps muscle so that the patella stays lined up in the groove. Patients report less pain and improved function with these forms of treatment. Our Physical Therapist will also examine and address any biomechanical issues with the foot and ankle with manual therapy or strengthening. He or she may also suggest special shoe inserts, called orthotics, to improve your knee alignment and function of the patella. Most patients take part in formal Physical Therapy after knee surgery for patellofemoral problems. Patients undergoing a patellar shaving usually begin rehabilitation right away. More involved surgeries for patellar realignment or restorative procedures for the articular cartilage require a delay before going to therapy. And rehabilitation may be slower to allow the bone or cartilage to heal before too much strain can be put on the knee. When you begin your Barkman & Smith Physical Therapy program, our first few Physical Therapy treatments are designed to help control the pain and swelling from the surgery. Our Physical Therapist will choose exercises to help improve knee motion and to get the quadriceps muscles toned and active again. Muscle stimulation, using electrodes over the quadriceps muscle, may be needed at first to get the muscle moving again. As your program evolves, our Physical Therapist will choose more challenging exercises to safely advance the knee's strength and function. The key is to get the soft tissues in balance through safe stretching and gradual strengthening. At Barkman & Smith Physical Therapy, our goal is to help you keep your pain under control, ensure you place only a safe amount of weight on the healing knee, and improve your strength and range of motion. When your recovery is well under way, regular visits to our office will end. Although we will continue to be a resource, you will be in charge of doing your exercises as part of an ongoing home program. X-rays may be ordered on the initial visit to your doctor. An X-ray can help determine if the patella is properly aligned in the femoral groove. Several X-rays taken with the knee bent at several different angles can help determine if the patella seems to be moving through the femoral groove in the correct alignment. The X-ray may show arthritis between the patella and thighbone, especially when the problems have been there for awhile. This is often refered to as chondromalacia patella. of the following procedures may be necessary. If your patella problems appear to be caused by a misalignment problem, a procedure called a lateral release may be suggested. This procedure is done to allow the patella to shift back to a more normal position and relieve pressure on the articular cartilage. In this operation, the tight ligaments on the outside (lateral side) of the patella are cut, or released, to allow the patella to slide more towards the center of the femoral groove. These ligaments eventually heal with scar tissue that fills in the gap created by the surgery, but they no longer pull the patella to the outside as strongly as before the surgery. This helps to balance the quadriceps mechanism and equalize the pressure on the articular cartilage behind the patella. If the misalignment is severe, the bony attachment of the patellar tendon may also have to be shifted to a new spot on the tibia bone. 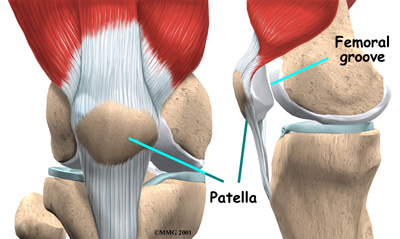 Remember that the patellar tendon attaches the patella to the lower leg bone (tibia) just below the knee. By moving a section of bone where the patellar tendon attaches to the tibia, surgeons can change the way the tendon pulls the patella through the femoral groove. This is done surgically by removing a section of bone where the patellar tendon attaches on the tibia. This section of bone is then reattached on the tibia closer to the other knee.